At the recent Bloom Festival I met Daniel Emerson of Stonewell Cider. This is a genuine craft operation in Nohoval, a place that sounds strangely exotic. It could be a far off city from a Conan Doyle story, nominally under the control of the Russian Tsar and exporting deadly intrigue to the rest of Europe. Or it could be a village near Kinsale, Co. Cork. Daniel tells me that an apple brandy is very much on his roadmap for future development. He is already fermenting apples for his cider so he is halfway there. Plus he has access to plenty of distilling expertise: his wife, Géraldine, is French and her family makes its own eaux de vie (fruit brandies). It wouldn't quite be the first apple brandy in Ireland. Longueville House has been bottling one for some years now, and very good it is too. There is room for more though. I'd like to see a shelf or two of Irish brandies beside the Irish whiskey at the airport duty free. Liquid Irish normally doesn't wet its lips with anything that hasn't been through the still but I think we can make an exception for Stonewell cider, as a portent of spirits to come. The cider is made entirely from apples - no sugar, no flavourings... That's not always the case with cider so it's worth noting. The cider-making begins as soon as the apples are harvested. They are all Irish, from orchards in Tipperary, Kilkenny and Waterford. They get washed, milled and pressed, then the yeast steps in to ferment the juice. That lasts 4-8 weeks until all the sugar is converted to alcohol. It's now an extremely dry cider that is left to mature for up to 18 weeks. In fact, it's several different ciders because the various varieties of apple have been kept separate up to this point. There are the cider apples, Michelin and Dabinett. And Elstar and Falstaff eating apples, which are fermented together. The result is a selection of ciders that can be blended for taste and complexity. All the sugar disappeared during fermentation so, to sweeten the final product, fresh Jonagored apple juice is added in. 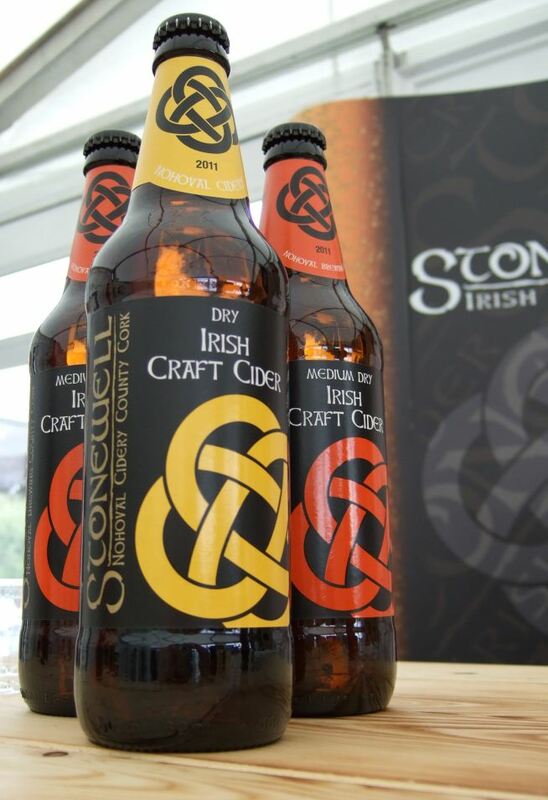 The Stonewell Medium Dry is a blend of all three ciders, with 40% fresh juice. The new Stonewell Dry blends only the Michelin and Dabinett ciders and contains just 10% fresh Jonagored juice to dial the astringency back a notch. The final steps are carbonation, pasteurisation and bottling. The year of the apple harvest is noted on the neck label. I assume, depending on the weather during the year and variations in fermentation, blending, etc, that one year's batch of cider can vary from another's. It's something to look forward to each year then, to check how the cider turned out. I tasted both the Dry and Medium Dry at Bloom and took away a couple of bottles of the Medium Dry. It's not too sweet. There is a quietly pleasant finish of apple drops. A 500ml bottle went down real easy, and I'm not a long drink guy. I'll be hunting down some more. I'm nominating this as my drink of Summer 2012, which is surely due any month now.